Desperate to get away from her mother’s oppressive clutches, Tina (Alice Lowe) decides to go on a week long caravan trip with her boyfriend Chris (Steve Oram). The holiday has been meticulously planned as Chris wants to show Tina his world. This includes such wonders of the UK Midlands as the Tram museum at Crich and the Cumberland Pencil Museum. Chris wants the holiday to be perfect. But his anger and resentment (for the people he meets and at his own life) cannot be contained - leading the couple down a dark and murderous path. I have to admit that I was a little nervous before I watched Sightseers. The last film I watched by director, Ben Wheatley, was Kill List and that left me feeling unsettled to say the least. Relax, I told myself, Sightseers won’t be anywhere near as horrifying as Kill List. So, I started to watch Sightseers. At first, I just did not know what to make of it. It felt strange, off kilter and I didn’t like the characters. In short, I had a feeling that I wasn’t going to enjoy the film. Then off Tina and Chris went on their holidays and, bam, I was hooked. I spent the rest of the film either laughing out loud at the brilliant central characters and the dark, dark humour or hiding behind a cushion as the movie took increasingly disturbing and violent turns. It was just all so unexpected (although looking back at Kill List, perhaps I should have seen it coming). The thing is, Sightseers is not the fun comedy romp portrayed in its marketing campaigns. (The film’s posters include the quotation: “The funniest British film of the year”.) While it is funny (very funny) it is also brutally dark, gruesomely violent and not for the fainthearted. Lowe and Oram are superb - they bring such depth to Tina and Chris, such chillingly understated menace. The fact that they are so natural together makes their actions seem so terribly plausible - even as they become more crazed. Tina and Chris put me on edge and I remained on that edge right to the film’s absolutely magnificent ending. I usually include a trailer in my reviews but, on this occasion, I decided against doing so as the trailer seemed to give so much away. I do think it is best to go into this film with as little knowledge of the story as possible. 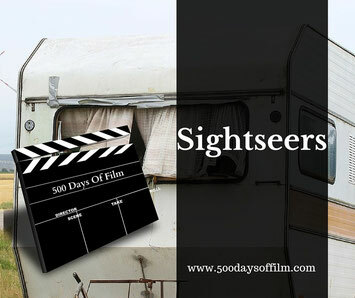 The screenplay for Sightseers was written by its two lead actors, Lowe and Oram. They developed their characters over a series of live performances and had, therefore, lived with them for years before the film was shot. This may well explain how they managed to disappear so brilliantly into Tina and Chris. Have you seen Sightseers? What did you think? Do feel free to leave me a comment in the box below!